One of my favorite projects to do with my students is about artist, Wayne Thiebaud. Wayne Thiebaud (tee-bow) is well known for his “dessert” paintings. Slices of cake, pieces of pie, wedding cakes and gum ball machines…if it contained sugar, then you might just find it as the subject of a Wayne Thiebaud painting. I always connect Wayne’s art to Presidents Day as we are “celebrating” the birthdays of George Washington and Abraham Lincoln with a cupcake. Here is a great clip from CBS Sunday Morning that contains an interview with Thiebaud that you could use as an introduction. I love this interview with him because it shows just how humble he is. He is an immense talent and sounds like his biggest critic, but what artist isn’t their own biggest critic? Currently, there is an article that is in Smithsonian Magazine discussing Wayne Thiebaud’s artwork too. 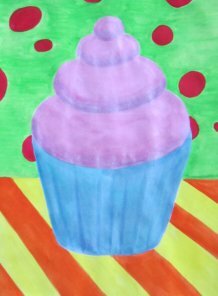 Here is an example of a cupcake painting that I created for this lesson. After creating the basic shapes together, the students can add a simple design for the table and wall. We used tempera cakes for the table and wall, and pearlescent paints (mentioned in a previous blog post) for the cupcake. His work just makes me smile! What is your favorite project to do to teach about Wayne Thiebaud?